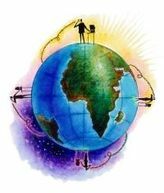 The ability to facilitate remote, one-on-one constellations via phone or Skype can vastly expand the geographic reach of your therapeutic or coaching practice. Your website naturally speaks to a worldwide audience--so why not serve (and earn) on that scale? I currently serve clients in Canada, the Caribbean, Hawaii, Europe, Australia, and New Zealand. Anywhere the language and time zones work. Even people 2 hours away are not always able to drive to your office. If you are currently facilitating in a practice group or for paying clients, or know the techniques taught in my Constellations Core Concepts and Home Altar Constellations classes--you are perfectly positioned to take this class and run with it. Since I began doing more remote constellations 6 years ago, both my client base and my earnings have grown to where I want them to be. Learning to offer these carefully and well can be a huge boost to your practice. Remote constellations can be done in one session, two sessions (an Intake separate from the Constellation), or 3 sessions (including now a short followup later). Because the client is not in the room with me, I favor at least the two session approach. I also then want to do the 30 minute follow up sooner or later. Sooner if urgent feelings have surfaced, later otherwise. 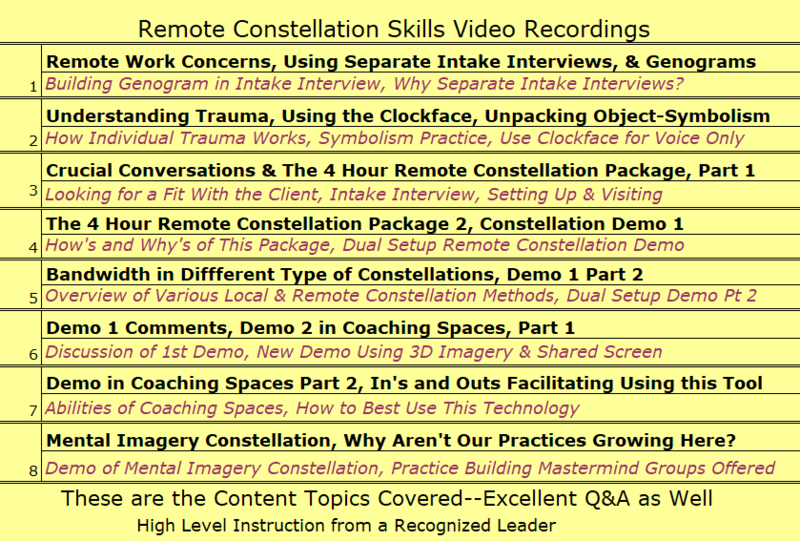 I encourage clients to choose the discounted "4 hour constellation package" that includes these, plus some email/phone support between sessions. Without the support of a workshop group, when you are not sharing physical space with the client, and often working with her or him for the first time--really connecting and creating rapport is very important. With Skype, Zoom, Google Hangouts, you have at least some sense of body-language, but with voice-only, you don't. The class teaches several ways to deal with this. Among them, again, my personal favorite is the three session constellation--where the separate, first hour is devoted to rapport, clarifying the client's goal, and geno-graphing more family history than I would every look for in a workshop. Next, during a 2-10 day pause, guidance about the interplay of goal and family history comes through--always for me, and often also for the client. What might be a family history information overload in a workshop setting becomes then an advantage. You have a really rich picture, and yet slow intuition from the Field during the break highlights what is important. Then we meet for the roughly 2 hour constellation itself. Follow up later helps me learn how well what I do works, supports the client, and often leads to further coaching or EFT work with the client. But, sometimes, clients do need a single session constellation--so the video training will focus on other ways to make up for the lack of physical presence as well. Separate Set-ups--Each of you set up different physical constellations using positions, furniture, or placed objects as representatives. Each of you visits the reps to feel into them, and the constellation progresses as you compare your impressions. But there's no attempt to create similar, or even track, the geometries among the reps in your different spaces. Complimentary Set-ups--As facilitator, using either my "clock-face positioning tool" for voice-only, or else pictures of the client's set up, you can keep track of the geometries and symbolisms on the client's side. Knowing these enriches the picture, even though you are not attempting to duplicate the client's geometry in your set-up. Each of these approaches has its advantages and disadvantages. To this, we now add the slower, Home Altar approach, in which the client sets up representatives using household objects on a dedicated altar space, and visits them over time. In this case, you may not duplicate the constellation yourself at all, but rather work with pictures of the client's altar in your weekly sessions with her or him. Why Not Take the Class With a Partner? One of the best ways to perfect these techniques is to practice them. Taking the class with a partner will give you the opportunity to practice using these and voice only communication to do actual remote constellations. The advantages learning these remote forms can bring to your constellation practice are transformative. Workshops don't work as well in North American as they do in other countries. Get started and learn how to do remote constellations now. You will never look back. Join in for a wonderful learning experience!